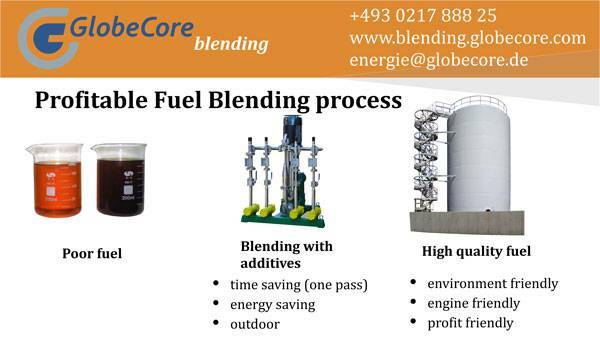 Essential operation and optimization of BioDiesel Blending systems in a flow is carried out by process engineers of the GLOBECORE company by whom it is developed and delivered on a mass production a number of mixing installations under the name "USB" of compounding of fuels and any liquids (from two to five components) in a flow including with components of a phytogenesis and bioethanol. BioDiesel Blending systems are issued in several types as stationary and mobile execution (the mobile can be mounted on trailers and semi-trailers, vans and railway platforms and as any other mobile means). Customer wishes and requirements are considered in case of manufacture depending on necessary compounding and a type of the final product. BioDiesel Blending is capable to make any class of fuel: diesel summer fuel, diesel winter fuel, diesel Arctic fuel, high-octane for Euro-4, Euro-5. The primary and indisputable benefits of technology of receiving compound fuels economic profitability belongs. But, both any project, and at the pure biodiesel has shortcomings. Basic purpose of our systems is the intensification of processes of dispergating, homogenization and emulsification various at first sight not mixable, not compatible liquids and suspensions which in the final result after processing form the steady fine mix. Final product has resistance to a continuous uniform period of storage and is steady against stratification. Compounder, cavitator, blenders, dispergators, homogenizers and mixers of other types. We are engaged in development of complexes to order – under requirements of the client, production for individual requirements, production with the smallest details of technical process, sale on a straight line from plant to the customer. Our USB blending systems are delivered worldwide, today are the more than 53 countries, hundreds objects where work with GlobeCore Blending installations, it speaks about that that these installations can work in any climatic zones and climatic conditions from-65 (HL2 execution) to +55 degrees Celsius. Compounding systems with productivity from 5 t/hour to 600 t/hour and possibility of compounding from the 2 to 7 compound components in any proportions with change of a share of a dosed component are on the modern market. Each unit of equipment is developed and made under specifically taken client, according to technical requirements of the customer; the equipment is integrated into existing productions, and also projected from the very beginning and on a turn-key basis. Our installations of compounding possess a number of advantages, and first of all it is the whole complete unit of the equipment which is easily integrated into any type of production. If you want to reduce expenses of you company for fuel production, "USB" cavitation blending system could help you to do that. To receive extra information contact us and technical manager will call you back or download inquiry list and receive free catalog.